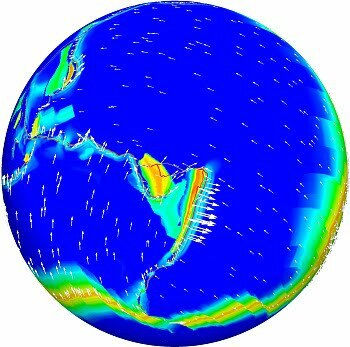 Computational scientists and geophysicists at the University of Texas at Austin and the California Institute of Technology (Caltech) have developed new computer algorithms that for the first time allow for the simultaneous modeling of the earth's mantle flow, large-scale tectonic plate motions, and the behavior of individual fault zones, to produce an unprecedented view of plate tectonics and the forces that drive it. A paper describing the whole-earth model and its underlying algorithms was published in the August 27 issue of the journal Science and also featured on the cover. The work "illustrates the interplay between making important advances in science and pushing the envelope of computational science," says Michael Gurnis, the John E. and Hazel S. Smits Professor of Geophysics, director of the Caltech Seismological Laboratory, and a coauthor of the Science paper. To create the new model, computational scientists at Texas's Institute for Computational Engineering and Sciences (ICES)—a team that included Omar Ghattas, the John A. and Katherine G. Jackson Chair in Computational Geosciences and professor of geological sciences and mechanical engineering, and research associates Georg Stadler and Carsten Burstedde—pushed the envelope of a computational technique known as Adaptive Mesh Refinement (AMR). "The complexity of managing adaptivity among thousands of processors, however, has meant that current AMR algorithms have not scaled well on modern petascale supercomputers," he adds. Petascale computers are capable of one million billion operations per second. To overcome this long-standing problem, the group developed new algorithms that, Burstedde says, "allows for adaptivity in a way that scales to the hundreds of thousands of processor cores of the largest supercomputers available today." With the new algorithms, the scientists were able to simulate global mantle flow and how it manifests as plate tectonics and the motion of individual faults. According to Stadler, the AMR algorithms reduced the size of the simulations by a factor of 5,000, permitting them to fit on fewer than 10,000 processors and run overnight on the Ranger supercomputer at the National Science Foundation (NSF)-supported Texas Advanced Computing Center. A key to the model was the incorporation of data on a multitude of scales. "Many natural processes display a multitude of phenomena on a wide range of scales, from small to large," Gurnis explains. For example, at the largest scale—that of the whole earth—the movement of the surface tectonic plates is a manifestation of a giant heat engine, driven by the convection of the mantle below. The boundaries between the plates, however, are composed of many hundreds to thousands of individual faults, which together constitute active fault zones. "The individual fault zones play a critical role in how the whole planet works," he says, "and if you can't simulate the fault zones, you can't simulate plate movement"—and, in turn, you can't simulate the dynamics of the whole planet. In the new model, the researchers were able to resolve the largest fault zones, creating a mesh with a resolution of about one kilometer near the plate boundaries. Included in the simulation were seismological data as well as data pertaining to the temperature of the rocks, their density, and their viscosity—or how strong or weak the rocks are, which affects how easily they deform. That deformation is nonlinear—with simple changes producing unexpected and complex effects. "Normally, when you hit a baseball with a bat, the properties of the bat don't change—it won't turn to Silly Putty. In the earth, the properties do change, which creates an exciting computational problem," says Gurnis. "If the system is too nonlinear, the earth becomes too mushy; if it's not nonlinear enough, plates won't move. We need to hit the 'sweet spot.'" After crunching through the data for 100,000 hours of processing time per run, the model returned an estimate of the motion of both large tectonic plates and smaller microplates—including their speed and direction. The results were remarkably close to observed plate movements. In fact, the investigators discovered that anomalous rapid motion of microplates emerged from the global simulations. "In the western Pacific," Gurnis says, "we have some of the most rapid tectonic motions seen anywhere on Earth, in a process called 'trench rollback.' For the first time, we found that these small-scale tectonic motions emerged from the global models, opening a new frontier in geophysics." One surprising result from the model relates to the energy released from plates in earthquake zones. "It had been thought that the majority of energy associated with plate tectonics is released when plates bend, but it turns out that's much less important than previously thought," Gurnis says. "Instead, we found that much of the energy dissipation occurs in the earth's deep interior. We never saw this when we looked on smaller scales."